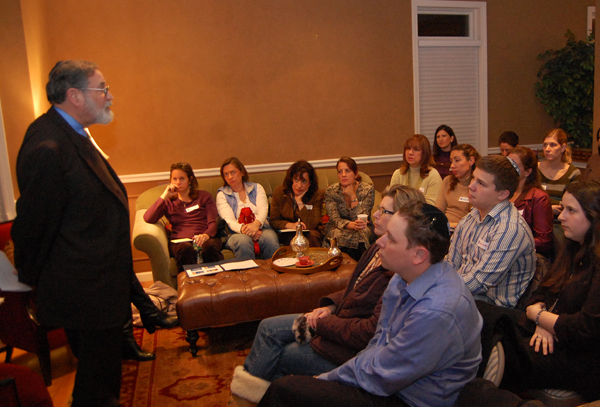 Dr. Elliot Spiegel meets with parents interested in the Rockland Jewish Academy. Reuben Gittelman Hebrew Day School had no sooner announced that it would be closing, than the Rockland Jewish Academy heralded its arrival. The new school, which is proposed to be housed in the Rockland Jewish Community Campus in West Nyack, will be an early childhood to fifth grade school run in partnership with the Solomon Schechter School of Westchester and will open in fall 2012. Although the Rockland school will be a community, or independent school, unaffiliated with any Jewish movement or denomination, the Schechter school and its Headmaster Elliot Spiegel, will oversee curriculum development, hiring, professional development and creating an educational mission. And although the Gittelman board of trustees cited declining demographics as an ongoing problem for the school, Spiegel says that without concrete evidence of such shifts, he’s forging ahead. “The creation of a really exciting Jewish private school in Rockland County will draw a substantial number of people who want their kids in a Jewish environment, who want a first class Jewish education but also a first class general education, and I’m going on that assumption,” said Spiegel. The school’s formation was announced in a meeting immediately following the one in which parents learned that RGHDS would close in June after 40 years of operations. Parents literally trudged, dazed, down the hall from the Gittelman gym to the school’s multi-purpose room to hear the RJA pitch. In the days following, the RJA has moved into high gear, scheduling two parlor meetings with Spiegel, one for parents with children in grades 2-4, and another for those with children entering preschool-1st grades. The school has asked parents to fill out letters of interest, and according to Brenda Lender, who has spearheaded the effort; the nascent school has approximately 80. Knowing parents must make their school choices for next year soon and that the RJA will need to begin renovating space at the campus, organizers have put themselves on a make-or-break deadline of Feb. 15. By then, they want parents seriously interested to make a $250 refundable deposit. Tuition will be $4,500 for three-day pre-K 3 program, $6,000 for a five-day pre-K 3 and 4 program, and $12,000 for kindergarten. First grade will cost $15,000 and grades 2-5 will cost $16,000. There will be chalutzim, or pioneer, grants available to help with costs. The grant will be a $1,500 tuition credit per student for the first two years for students in grades K-5. There will also be a tuition freeze for the first two years for all grades. Tuition will not cover the cost of educating the 12-15 students RJA is hoping to attract per grade, and will have to be supplemented by grants and fundraising. Lender says that organizers are in consultation with various organizations for grants and seeking a funder for the chalutzim discount. The Jewish Federation of Rockland County has promised, from its Lily Steuer endowment fund, a $15,000 grant to start a library. What organizers are hoping to create is something that achieves the academic reputation of the Schechter Westchester schools, which span early grades through high school, while not losing the hemische, or family, flavor that permeated Gittelman. The school would be located on the 2nd floor of the campus, in two perpendicular wings that currently house the Jewish Federation of Rockland County, Hadassah and some JCC offices and classrooms. In the coming months, those would be moved and the space would be renovated. Students would have access to JCC playing fields, the gym and other specialized facilities. Spiegel foresees the ability to partner with JCC programs, including arts and fitness ones, as well as creating some kind of ongoing mitzvah programs with seniors. There’s early talk of creating something along the lines of the JCC’s School Aged Care and programs for after care, as well. The Rockland County Board of Rabbis has thrown its support behind the school, meeting with organizers and drafting a letter of support. According to Rabbi Daniel Pernick, president of that board and spiritual leader of the Reform congregation Beth Am Temple in Pearl River, the loss of Gittelman after 40 years was a significant one for Rockland County Jews whether or not they were personally connected to it. “It’s very symbolic, and it diminishes the entire community,” he said. Having a viable option for community-wide day school education is something the rabbis felt would enhance and strengthen the community. If synagogues and organizations only look out for their own interests, “We will be a very fractured group of Jews, with no community. “Very often, everybody is focusing on what’s best for their piece of turf in the community,” he said. “If this is all going to work, the goal has to be community.